When your child is born, baby-proofing your home may be the furthest thing from your mind.. However, even when your little one is tiny and depends on you to get around, you should be considering the ways you can make your home safer. Because, before you know it, that precious infant is going to be cruising around. Once your little one starts to pull themselves up on furniture in an effort to stand, or begins to climb as they explore their environment, furniture such as television stands, bookcases and even ovens become hazards for tipping and falling onto your child. Anchors are an inexpensive solution that require you to attach one piece to the furniture and the other to the wall. 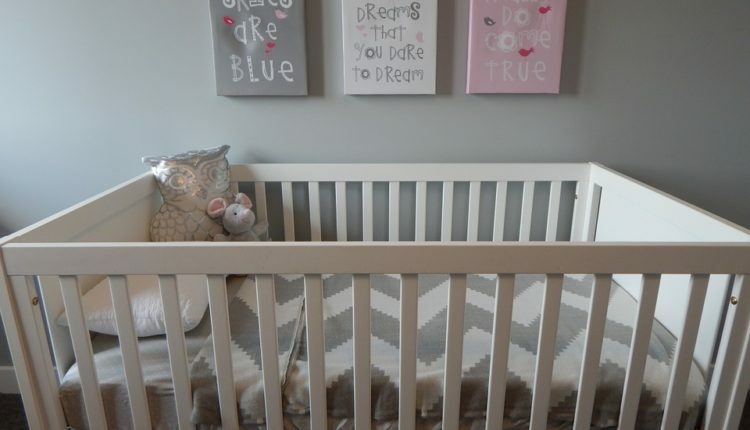 With the threat of SIDS (Sudden Infant Death Syndrome) ever looming, even in our day and age, you can never be too careful with your little one’s sleeping arrangements. First of all, ensure that your crib is safe and up to code. Cribs with drop-down sides are no longer manufactured and are deemed a huge risk for strangulation. Be wary of second-hand cribs since they may be missing hardware or have worn down hardware. To check the list of recalls for cribs, click here. Secondly, you need to make sure the interior of the crib is safe for your baby. Check that the mattress fits properly by placing two fingers between the mattress and the side of the crib. If there is plenty of wiggle room, your mattress is too small. An infant could get his or her face stuck in the gap and suffocate. Lastly, remove all pillows and stuffies from the crib. If a baby rolls onto these plush items, they could suffocate. If you feel a blanket is needed, use a loose knit one tucked under the bottom of the crib mattress by your baby’s feet. Baby-proof latches are easy to come by and can make a great difference in making your home safe for your little one. Kitchen and bathroom cabinets should be locked to prevent access to cleaners, chemicals, bags and sharp objects. Speaking of cleaners and chemicals, they should be completely out of reach from children, either by locking them up or placing them in a high location. These products are often colorful and appealing to children – but can cause serious injury or poisoning. The toilet should also be latched to prevent the risk of drowning. A curious toddler can easily fall head first into the water – and only 2 inches of water is necessary to cause a drowning. A motoring child has little to no coordination, making falls and tumbles frequent occurrences. Sharp corners, such as door casings and coffee tables, should be covered and padding to prevent bumps and cuts. While you’re covering sharp corners, consider placing a faucet cover over the one in your tub. It goes without saying that bathtubs are slippery surfaces and, even with close supervision, falls can happen there too. I don’t know why children are typically fascinated with sticking things into electrical outlets, but some are and the result could be disastrous. Outlet cover are cheap, easy to install and easy to remove by adults. Cover any unused outlets to eliminate the risk of electrocution. Anywhere there is a staircase there needs to be a baby gate. A tumble down the stairs could result in breaks, bumps, bruises or head injury. Baby gates come in many styles, but be weary of the design you choose to protect your little one from staircases. Pressure mount gates are a great temporary solution since they require no installation – but may not be appropriate for the top of a staircase. A good push and the gate could possible dislodge. These are best suited for doorways. Hardware mounted gates are recommended for staircases since they are secured to the wall and cannot be dislodged. Most are designed with an adult-friendly opening latch, making it easy to pass through the gate.